A few months ago I installed Lutron's RadioRA 2 wireless lighting system in my own home, along with their wireless thermostat and Sivoia QS Wireless shades. This was a retrofit installation, and I'm happy to report that it was easy to install and the end result is fantastic. If you experience the convenience, aesthetic, and safety benefits for yourself, you'll wonder how you ever lived without it. In this blog post, I'll explain how the RadioRA 2 system is Easy, Convenient, and added a new Aesthetic I wasn't expecting. Part 2 of this post will highlight the Safety and Energy Savings benefits. The justifiably famous RadioRA 2 lighting system was easy to retrofit. For the most part, you simply replace existing switches and dimmers with RadioRA 2 pieces. They make a few different models, including ones that can dim the ever more popular LED light bulbs. Using Lutron's "hybrid keypad", which is a combination dimmer AND keypad, I have all of the convenience of a keypad WITHOUT having to cut open the walls. The RadioRA 2 system is wireless, so your walls don't need to be cut open to run wires between all of the various keypads, dimmers, switches, appliance modules, thermostats, and motorized shades. Lutron's Sivoia QS Wireless battery-powered shades and wireless thermostat were big announcements in 2011. These shades offer the same quiet motors as Lutron's hard-wired shades, and there is a large selection of standard and luxury shading fabrics to choose from. Notably, they are easy to install…again, no cutting walls open. For the Master Bedroom, I installed a sheer fabric shade for soft-filtered light during the day. Behind the sheer shades are motorized blackout shades. With operation twice a day, the D-Cell batteries can last up to 3 years. When the batteries do wear-out, they can be changed in no more than 15 seconds, without taking the shade down from the window. The shade headrail simply pops forward, and you drop in the new D-Cell Batteries. Easy. The lighting keypads have buttons that control both a single lighting load (such as a chandelier) and ‘scenes’. A pre-programmed lighting scene can conveniently ‘control’ multiple circuits at the same time. For example, the 'Pathway' scene lights a table lamp, a track light, and my stairwell chandelier to 30% brightness to give a safe pathway between downstairs and upstairs. Using Lutron's battery-powered motion sensors and the astronomic time clock built into the RadioRA 2's brain, I have the pathway scene triggered ‘on’ automatically after 9:30 PM if you enter the sensor's path, and it turns off at sunrise. No having to even touch a dimmer or keypad! 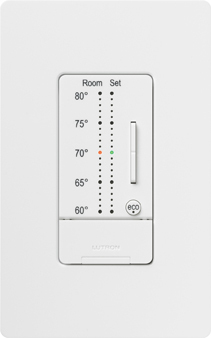 The Lutron sensor meets California's strict Title 24 Energy Code. Having 'Downstairs Off' and 'All Off' lighting scenes is convenient…one button can shut all of the lights off. Every keypad has an up/down dimmer button, so as long as you're not using standard fluorescent lights, you can dim or brighten each scene or lighting load easily. 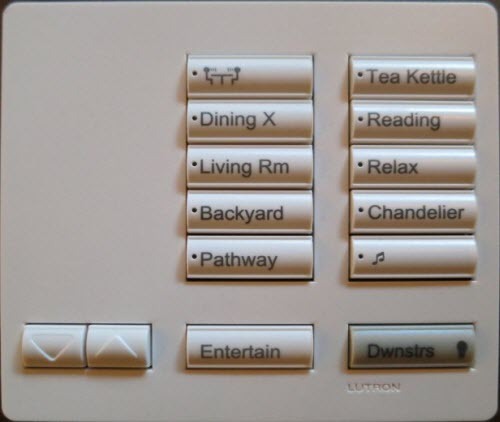 You'll notice a 'Tea Kettle' button on the wireless keypad picture…my wife is an avid tea drinker (she's English afterall), and now she can turn the tea kettle on from the bedroom thanks to the RadioRA 'appliance module' (which is basically a remote-controlled AC outlet). By the time she makes it downstairs, the water has boiled. Definitely convenient! Another convenience feature of the RadioRA 2 system is the ability to use wireless keypads (see picture). These give you a lot of control in a small and portable form factor, and are convenient to have at your night stand and on coffee tables. 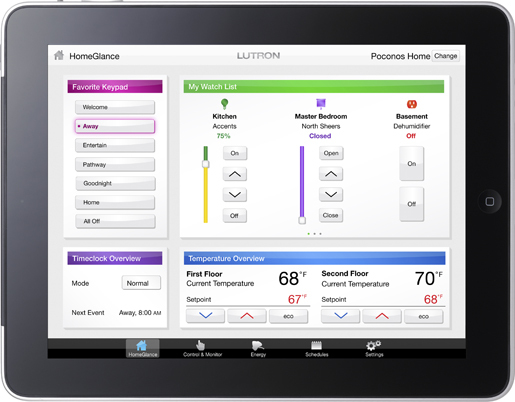 A huge convenience is the Lutron Home Control+ app, available for iOS and Android devices. With it, I can control my home from my iPad, iPod Touch, and Android phone both inside and outside the home (remote control from anywhere with a data connection). From this app you can control lights, shades, and temperature. You can also make your light and temp level edits and save the changes from the app! The RadioRA 2 system fully integrates with all of the major home automation / home control companies such as Crestron, Control4, Savant, and AMX, further adding convenience. Nice! Preprogrammed lighting scenes, such as 'Relax', light the downstairs in a very moody ambiance that makes our Living Room have a whole different “feel”. The thermostat model I chose allowed me to eliminate the previous thermostat from the all entirely. The wired HVAC controller resides with my HVAC equipment, and the flush-mount seeTemp Wall Control fits inside a standard single gang electrical box. The seeTemp control matches the Decora-style dimmers, switches, and keypads of the rest of the RadioRA 2 pieces. The motion sensors I mentioned earlier automatically turn on our 'Pathway' lighting scene at night, and another motion sensor turns on one of the Master Bathroom lights On to only 7% brightness, just perfect for middle of the night "pit stops". After 5 minutes of inactivity, the motion sensor turn off the lights automatically. No bumping into things in the middle of the night. An 'Away' button makes our house look occupied while we are out of town. For the 'Away' scene, I selected several lighting circuits throughout the home and have them turn On and Off within certain timeframes; and the trick to make the house really look occupied is that the RadioRA 2 system randomizes the On/Off times by up to 30 minutes. This is MUCH more effective than using basic wall timers that we used before. If we hear a strange sound at night, one of the keypad buttons in our bedroom turns our exterior lights On, and turns Off any interior lights. If there is anyone outside, we can see the perp, but not vice-versa. Next, I'm going to integrate it with our security system. When we do so, when the alarm is triggered, we can have certain lights turn on automatically, and even flash all of the exterior lights On and Off repeatedly to call attention to the house. The RadioRA system is built around dimmers, and by default I have most of my lights turn On to 90% brightness instead of 100%. The difference in brightness is hardly noticeable, but my light bulbs will last nearly twice as long and I'm saving energy at the same time. Most of my lighting 'scenes' have lights come On to even dimmer lighting levels, some at only 50% brightness, which not only adds to the mood ambiance, but saves energy. The wireless thermostat offers all of the energy-savings of any modern digital thermostat (separate temp set points for Morning, Day, Evening, Night), plus the 'Away' button I use for when we're on vacation sets the HVAC system in standby mode…only coming on to heat or cool in extreme temperatures (Woodland Hills, California can get HOT!). Since the system is connected to our phones with the iOS and Android apps, we can turn on the HVAC before we get home from vacation. The last post mentioned I installed motorized shades in the bedrooms. They have a rated 'R Value' for their insulation properties. The sheer shade has an R value of .7, the but the room-darkening 'blackout' shade has an R value of 4.3. This helps keep the bedrooms from getting overly warm when we're not using them. Every little bit of energy savings helps, and HVAC energy costs are amongst the highest in the typical home. Can you tell I like the RadioRA system yet?? I love it! It has made our home more convenient, safer, energy-efficient, and elegant at the same time. It is easy to retrofit in any existing home. If you live in Southern California and would like to have a RadioRA system designed for you, give us a call at 866-692-8489. We have offices in Los Angeles, Santa Barbara, and Newport Beach.